How much does it cost to attend an MCTC course? MCTC is a Department of Defense funded program on a year to year basis. With our funds, we are able to provide free training to all law enforcement, military and prevention professionals. There are no tuition/registration fees associated with our training. How do I register for an MCTC course? Registrations for all courses will open 6 months prior to the start date via the website. To enroll for a course, click on “Course Descriptions”, then click on the name of the course you want. To see the schedule by month, click on “Course Schedules.” From either link, the dates will be visible to what is open for registration. Once I have registered, how do I know my registration has been accepted? Once you have submitted a registration, you will receive a confirmation email via the email address you provided for the student. Unfortunately, confirmation emails can just be sent to the student’s email, not the supervisor or training officer. What does "waiting list" registration mean? If you find a course that you would like to attend and the link says “Waiting List Registration” that means you will go directly to the waiting list for the course. The waiting list is set up as first come, first serve. In the event of a student cancelling, the next student in line will be generated an email asking them if they can still attend the class or not. They will need to respond to this email within 72 hours stating if they can attend or not. After I have received my confirmation email, what should I expect next? MCTC will send out a Welcome Letter via email to all the students 2-3 weeks prior to the course start date. This letter will include course location, address, lodging info (if provided), start time, class attire and any other information that will be useful to you before the course begins. If lodging IS NOT PROVIDED for the course, it is entirely up to the student/agency to make their own reservations and pay for it. What happens if I need to cancel from a course I'm already registered for? If you are registered but cannot attend a class for any reason, please contact us to cancel your seat. This will allow another spot to open up for someone wanting to attend the course, especially if there is a wait list. The explanation letter about Missouri POST that I have received with my certificate doesn't include a breakdown of hours. What training core areas do the training hours belong to? MCTC courses are Missouri POST certified through Missouri's reciprocal agreement with Minnesota. Unfortunately, Minnesota doesn't track their hours by the same Core Areas as Missouri POST. Ultimately, it is up to your agency to determine how to apply your hours. For more details, check out the Missouri POST website here. 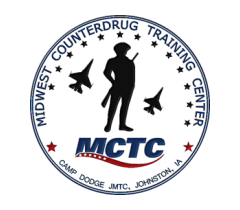 Additional Questions: Questions regarding registration procedures or status should be directed to the MCTC Administrative Office (1-800-803-6532 or info@counterdrugtraining.com).